The Prince has long been both praised and reviled for its message of moral relativism and political expediency. Although a large part is devoted to the mechanics of gaining and staying in power, Machiavelli's end purpose is to maintain a just and stable government. He is not ambiguous in stating his belief that committing a small cruelty to avert a larger is not only justifiable but required of a just ruler. Machiavelli gives a vivid portrayal of his world in the chaos and tumult of early-sixteenth-century Florence, Italy, and Europe. He uses both his contemporary political situation and that of the classical period to illustrate his precepts of statecraft. 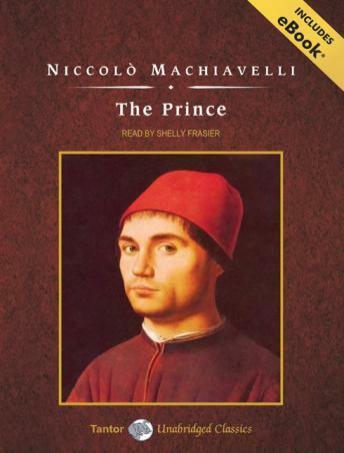 I had always heard that Machiavelli's "The Prince" was a must read on the basics of statecraft - now I know it is true. Machiavelli discusses the various forms and factors of creating, running and keeping a state. Still relevant, even in today's times. Machiavelli's arguments are a bit "pat". He likes to establish dichotomies and trichotomies, and answer each category of possibility. It strikes me that he broke a lot of new ground, establishing "rules for statecraft", but I found much of his analysis either too simple, or his examples insufficiently explored, to be much educated. Perhaps that's a good thing; it's an amoral education he promises, anyway. The narration is not flawed, but not compelling, either. The material itself is excellent and timeless. This production has been rendered in a competent fashion, but with little finesse. The work is accessible to almost all who would read (or, in this case, listen to) it; but I would have preferred a more robust and sympathetic reader. I love this book. The reader is very good, and there is a nice introduction on the life of Machiavelli. Although written on how to run a state, I find it very insightful in dealing with most social situations particularily in the office.